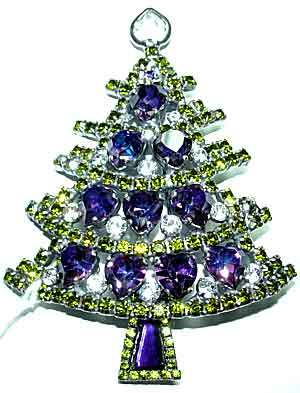 Description: Bauer Medium Navette Tree in Fuchsia Pin - If you like the large navette tree but find it to be, well, too large, then we have the same basic design in a 2 3/8" x 1 1/2" x 1/2" deep size, free standing, in fuchsia navettes with clear rhinestone outlining. Goldtone. Available in several other color combinations, by special order. 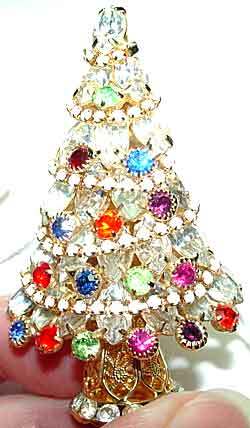 Description: Bauer Large Navette Tree in Multi Pastels - Same tree as DP3-123, this measures 3 3/8" x 2 1/2" x 1/2" and is free-standing for display , with pink marquises, aqua pears and multi pastel rhinestone chain in antiqued silvertone. Another breathtaking limited edition. 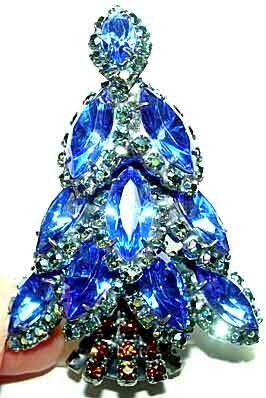 Description: Bauer Medium Navette Tree in Sapphire Blue and Green Aurora Borealis- Again, 2 3/8" x 1 1/2" x 1/2" deep size, free standing, in sapphire colored navettes with green aurora borealis rhinestone outlining. Antiqued silver, limited edition, #18 of 120. 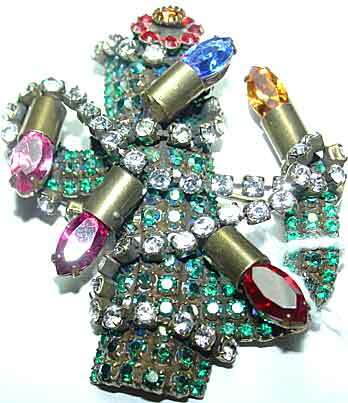 Description: Dorothy Bauer Christmas Cactus Pin (small) Miniature version, (1 1/2" x 1 1/8") in emerald green and emerald green aurora borealis, pink, fuchsia, red, blue and topaz "bulbs" , clear rhinestone chain and light siam cactus flower, antiqued brass setting. 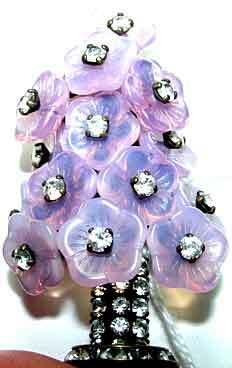 Description: Bauer Merry Cat Mouse Tree Pin - Classic DB! Deep emerald green oval and round "cats" are trimmed with clear rhinestone chain with clear rhinestone mice with little red rhinestone noses! 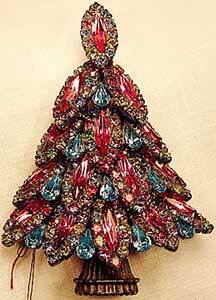 A few red rhinestone balls dot the tree, and it all sits on a clear rhinestone base. A red rhinestone heart in the center lets everyone know how we feel about our kitties! 3 1/4" x 1 1/2". 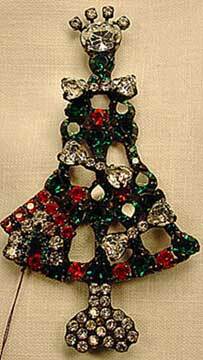 Description: Bauer Doggone Christmas Tree Pin - And for the Fido fan, this tree features dog bone trim, a dog house in Christmas colors, and a paw print for a star! Even the base looks like a milk bone. The perfect gift for all dog lovers, and what a conversation piece! 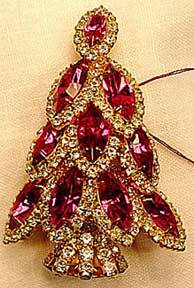 Red, green and clear rhinestones in goldtone setting, 3 1/4" x 1 3/4". Description: Bauer Tree of Hearts Christmas Tree Brooch - A retired limited edition design, we have two of only 50 in existence. The hearts and the tapered baguette at the bottom are purple but have blue flashes when rotated. Surrounded by rows of olivine rhinestone chain, with clear stones alternating with the purple hearts, and a single unfoiled bezel set heart at the top. At 3 1/4" x 2 1/2" this is one of Dorothy's larger trees. Dark silvertone (almost gunmetal) setting. Book piece. 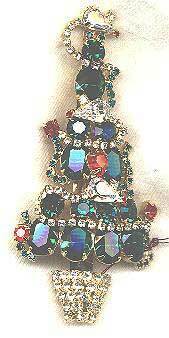 Description: Bauer Jeweled Joia Tree Brooch - Done in a diagonal stripe, this uses unfoiled teal pears and melon stones, a row of hyacinth (orange), fancy cut clear cushion trillions that are extremely refractive (think old Eisenberg Original stones) a row of watermelon and fuchsia round rivolis, clear square rivolis, and a fuchsia navette. All sits on a frosted clear deco looking "base" made from vintage glass. #13/75, this limited edition is a book piece. Two slight fleabites on the vintage base sides (. 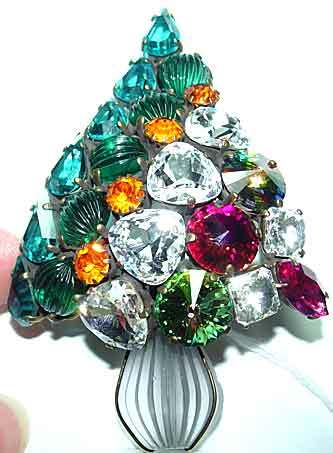 Description: Bauer Christmas in July Tree Pin - One of Dorothy's most popular trees ever, this retired book piece (#66 of 150) was a limited edition due to the use of vintage glass floral pieces and was an almost immediate sell out when first issued. 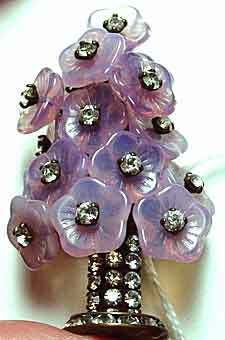 Antiqued brass setting, with translucent glass floral pieces in lilac attached with clear rhinestone headpins above a base made from a slanted rhinestone rondelle under soldered clear rhinestone chain. I have photographed this both with and without flash so you can see the colors. Grab this quick before it's gone. ONE ONLY. 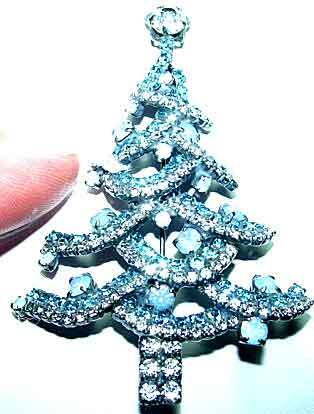 Description: Bauer Criss Cross Tree in Aqua, Opaline and Clear Rhinestones - An unusual color combination for this DB classic, this uses aqua and clear rhinestone chain for the branches and small "white" opaline rounds and larger "blue" opaline rounds for decoration. Top stone is a round clear set in a star shaped setting. Darkened silvertone setting. 2 3/4" x 1 7/8". 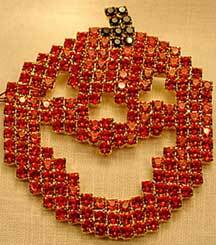 Description: Bauer Jack O'Lantern Pin - Bright hyacinth rhinestones topped with a black rhinestone handle. Set in goldtone; all stones are prong set. About 1.75" across and 2" top to bottom. You'll wear this for years.